Fire Bags of the Western Cree with loom-beaded drops are rarely found in today’s antique market. John Molloy Gallery is proud to present three examples in our current on-line show. The earliest example uses pony bead in the loom woven panel. The pony bead era is generally thought to have ended around 1860. 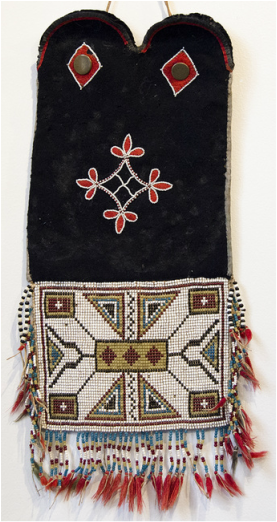 This bag also features appliqué beadwork in an abstract floral design that clearly shows the influence of the French traders so familiar to the Cree. The other two bags feature a more naturalistic floral representation in the upper bag but the same type of geometric design in the loom woven panel with the smaller seed beads. The example with the green tassels found its way to London where it was sold in 1949 at the Portobello market and has remained in the same collection until recently. It is also in spectacular condition as is the example from the 1890’s that was collected by a Danish woman when she emigrated to Canada at that time. She sent it home to her sister in Denmark whose descendant recently sold it to the gallery. This gorgeous bandelier bag was collected in 1910 in Western Idaho by an east coast couple on their honeymoon. It descended through their family until September 2015, when acquired by John Molloy Gallery. The bag is in perfect unrestored condition.